We are surrounded by noises all the time and for some, even the most relaxing time like reading a book or enjoying a nap can have audible interruptions. In today’s environment people struggle with noises 24/7, from hearing neighbors while you are at home, traffic outside and phones at the office. If loud commotion and noise disturbs you, it’s important to understand that you are experiencing the phenomena of noise pollution – the excessive noise that harms the activity of a human life. 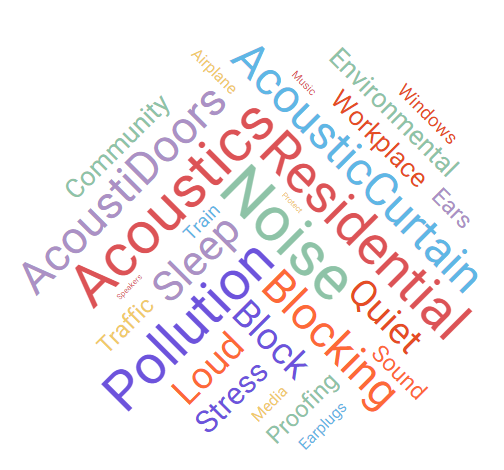 Noise pollution can be placed into three separate categories: environmental, community, or workplace noise. Environmental noises are typically the once we hear outside. Aircraft, railway and roadway noise are three of the most serious contributors to noise pollution worldwide. Excessive traffic (and oh those drivers who like to blow the horn!) are part of environmental noise. Even poor urban planning can influence the levels of noise pollution. Community noise (also called neighborhood noise or residential noise) includes barking dogs, loud parties, police sirens and boom cars (vehicles with high-powered audio systems). I bet you encounter this type of noise regularly. By the way, industrial noise (such as noise from local businesses and their clientele, construction noise, and street noise) belong to this noise category. Workplace noise is simply the sounds at your office or wherever you work. Ringing phones, colleagues loud chatting, printers and fax machines constantly buzzing around you are all workplace noises that can cause health hazards or stress to the mind. Please note that if you are working on a construction site or at the airport, the noise is still environmental and not a workplace one. Check into the noise pollution laws in your area. Most urban communities have rules to prevent noise pollution from getting out of control. Make use of the online resources in your area where you can find contact information for noise regulation personnel and community consortiums dedicated to creating a more peaceful space. Earplugs. Sometimes the simplest solutions are the most effective. If nighttime noise keeps you awake, earplugs can be a low cost solution. Earplugs can also be great if you are going to a noisy event, concert or are traveling. Even though they don’t block all the noise, they bring the noise level down to a manageable level. Put down the electronics. In today’s society we are constantly connected by social media and can get accustomed to browsing a cell phone multiple times a day, or for some, every hour. By limiting the time you spend using electronics after work hours, you can find create quiet time for yourself to relax your mind. Soundproof your space. Windows are a known weak point in many structures. Our sound proof curtains – AcousticCurtains™ – and soundproofing door covers – AcousticDoors™ – are designed to block outside noise from entering your space. Also, read our detailed guide to know how much sound you can expect your soundproofing curtains to block. Focus on Relaxation. Sometimes it may be impossible to reduce the level of noise you’re experiencing and in this case the best thing you can do is to focus on relieving stresses. Soft white noise in the background can help, along with dimly lit lighting and calming smells like lavender or vanilla. Even if noises interrupt your space there are things you can do to help prevent or control them.